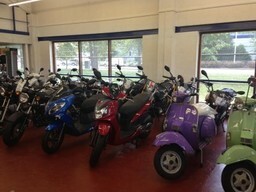 Highway Motorcycles have over 30 years of experience in dealing with major bike manufacturers. 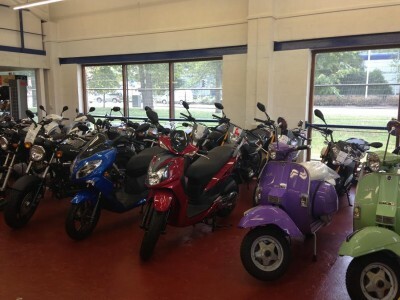 Their experienced and friendly staff combine with excellent on-site facilities to provide a vast range of new and used motorcycles, scooters, custom bikes, sports bikes and everyday commuter bicycles. They also run an online shop that stocks motorcycle helmets, clothing, boots, new and used spare parts alongside other various accessories. Professional servicing and repairs are made available by a highly trained team of experienced technicians with in-depth industry knowledge, able to provide motorbike servicing, repairs, valid MOT tests and much more. 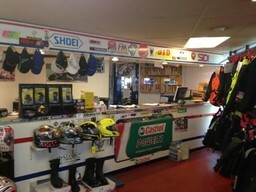 Other services provided by the Motorcycle Service Centre includes approved alarm installation, computerised MOT testing, approved insurance repairs, accident insurance repairs, factory diagnostics and a complete tyre fitting service. This quick fit tyre shop is suitable for all types of motorcycles and scooters, working with leading brands such as Michelin, Bridgestone, Pirelli, Continental, Dunlop and a huge range of competitive budget tyres. Used bikes are always wanted by Highway Motorcycles and often they will be willing to pay cash on the spot for your used motorcycle or scooter. 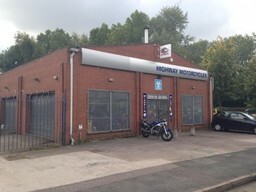 With a huge showroom in Moseley Street, Highway Motorcycles are well located to serve customers across the West Midlands including Stoke, Stafford and even Telford or rural Shropshire. If you're looking for a new bike, motorcycle repair or want to sell your used bike, Highway Motorcycles in Wolverhampton can help.